Yesterday, my in-laws took the kids and us to Cherry Crest Farm in Ronks, Pennsylvania. It’s in Lancaster County. Lots of beautiful farmland and near the Strasburg Railroad. Boy did I love that train ride when I was a kid. But I’m getting off track here. No pun intended. There was a real campfire where you could rest and warm up. Bails of hay made tunnels and playspace for big and little kids. There was a trampoline – actually a jumping pillow they called it – 40′ wide by 80′ long and almost 4′ tall in the middle. We spent time in the petting zoo and walking around. Life is a lot like this maze. First of all, this corn maze started off (in August) green and fresh and ended up all dried up (in November). Okay, that wasn’t really my point, but I crack myself up. But back to my real point. As if. First of all, we were all in it together. We worked as a team. We discussed at critical times and joked and held hands at others. We were happy to be together. At every turn, we had to consider the options. There are always choices. Knowing how to gather the facts, ask the right questions, and understand the risks helps us figure out which path to take. As in life, we don’t always agree. But we listen to each other and make a group decision. And we all tried to be respectful of the others’ points of views. Sometimes, we get carried away with the fun and make bad choices. Hmmm. That sounds about right. Sometimes, we take things too seriously. And sometimes, one or more people want to quit. Take the escape route. More worrisome is that sometimes, there’s an emergency. Fortunately, in the maze, there was a spot-a-pot. The toughest decision was whether to leave the maze when we figured out where the exit was or to continue on the get the rest of the puzzle pieces. Leaving felt like an accomplishment – we’d solved the maze. Would it be more of an accomplishment to get all the pieces to the puzzle? Was that our goal? Interestingly, we didn’t all have the same goal. We didn’t discuss it beforehand either. But, we made a democratic decision (the kids won) and we had a lot of time to play at the farm afterward. Had we stayed in the maze, we would have sacrificed that. The competitive streak in me wanted to play it out – finish the maze the RIGHT way. But what is the right way? In this case? The right way was spending an exhilarating day in the country with family. I don’t get it. You didn’t finish the maze. Shame. That maze looks amazing…lol. 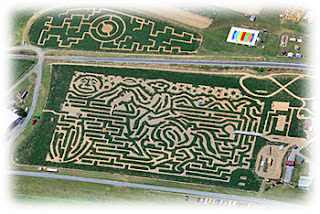 Seriously though, how can they do that, a discernable pattern in the corn as well as a maze? So clever! liked your day in the maze analogy too.